In October 1910, this photograph appeared on the front page of The New York Times after a reporter stole it from the home of Cayce’s parents to use for a story. Edgar Cayce (March 18, 1877 – January 3, 1945) (pronounced "Casey") was an American psychic who could channel answers to questions on many spiritual topics, including history, astrology, and health. Most of his work consisted of diagnosing and prescribing cures for individuals with physical ailments. These readings involved many alternative health concepts and practices. He performed the readings while in a self-induced trance state. When he awoke from trance, he remembered nothing, and thus, he is commonly referred to as "The Sleeping Prophet." Skeptics consider Cayce a charlatan, while for others, he was a prophet pointing to hidden depths of, and new possibilities for, human existence. His predictions about changes to the planet, which pre-date scientific concern about climate change and the melting of the polar ice, can be taken as lucky guesses or as evidence of his paranormal ability. Cayce's concern for holistic health of the body and the ecological health of the planet are amazingly contemporary. Cayce did his best to avoid abusing his gifts and tried throughout his life to help others. A practicing Christian, his theological views departed from orthodox beliefs in several areas, such as reincarnation and reaping what one sows. 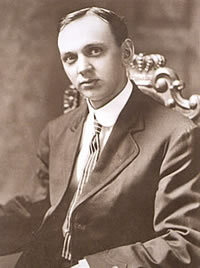 Edgar Cayce was born into a farming family on March 18, 1877, near Beverly, seven miles south of Hopkinsville, Kentucky. At the age of six, young Cayce told his parents that he could see many things that appeared invisible to everyone else. He would see the souls of the deceased and talk to relatives who had recently died. For the most part, his family attributed these experiences to an overactive imagination. He did, after all, have many invisible friends, as do many average children, so they paid little attention to their son's unique experiences. As a child, Cayce found comfort in reading the Bible and decided to read it through, from cover to cover, once for every year of his life. He understood even at a young age, the importance of faith, love, and morality. He grew very fond of Bible stories and its teachings which inspired him and sparked his spiritual curiosity. The more he read, the more unquenchable his thirst for God became. At the age of thirteen, he had a profound spiritual experience that would change his life forever. He took his Bible to a playhouse in the woods, overlooking a creek. While reading, a beautiful woman in brilliant white clothing and wings suddenly appeared before him. She said, "Your prayers have been answered, little boy. Tell me what it is you want most of all, so that I may give it to you." Though shocked and in a state of disbelief, he responded with, "Most of all I would like to be helpful to other people, especially children." Upon completing his wish, the woman quickly vanished. Shortly after the appearance of the apparition, he displayed a talent that could no longer be explained or dismissed as simply "imagination." He could sleep on his school books and acquire a photographic memory of their entire contents. It was found that he could sleep on any book, paper, or document, and upon awakening, he had the ability to repeat word for word, any length of material, even if it contained words far beyond his limited education. In order to help his family recover from financial hardships, Edgar left school after he completed the eighth grade and began working with his uncle on his grandmother's farm. In those days, an eighth grade education was seen as more than sufficient and perfectly acceptable for a working class individual. About a year later, his family moved to Hopkinsville where he then began working at Hopper's Bookstore. This bookstore specialized in occult and osteopathic works, and he may have consciously or otherwise absorbed much of this material, which may have given rise to his abilities as a psychic healer later on. A few months after moving to the city, he met Gertrude Evans. They began a courtship, and at the age of nineteen years old, Cayce got engaged to her and they decided to get married as soon as he could support a family. They married six years later. In 1900, he formed a business partnership with his father to sell Woodmen of the World Insurance, but was struck by severe laryngitis in March that resulted in a complete loss of speech on April 18. Unable to work, he lived at home with his parents for almost a year. He then decided to take up the trade of photography, since it required minimal exertion of his vocal cords. He began an apprenticeship at the photography studio of W.R. Bowles in Hopkinsville. A traveling hypnotist and entertainer known as "Hart—The Laugh Man" was performing at the Hopkinsville Opera House in 1901. He heard about Cayce's condition and offered to attempt a cure. Cayce accepted and the experiment took place on stage in front of an audience. Remarkably, Cayce's voice returned while in a hypnotic trance but reverted back to paralysis upon awakening. Hart suggested that the voice would begin to function after the trance but this proved unsuccessful. Since Hart had appointments in other cities, he could not continue his hypnotic treatment of Cayce. He then sought out treatment close to home and soon discovered a local hypnotist by the name of Al Layne. Mr. Layne agreed to help Cayce in restoring his voice. Layne suggested that Cayce should attempt to describe the nature of his condition and cure while in a hypnotic trance. While in trance, Cayce revealed that his voice loss was due to psychological paralysis and could be cured by increasing the blood flow to the voice box. While still in trance, Layne spoke to Cayce, telling his body to increase circulation there. Almost immediately Cayce's throat turned bright red. After only 20 minutes, Cayce declared the treatment over and awoke from his unconsciousness. Upon awakening, he proceeded to speak for the first time in months. Relapses of his ailment occurred but were corrected by Layne in the same way and eventually his recovery remained permanent. In his own reading, Cayce described his own ailment from a doctor's point of view, stating, "We have the body." These words would soon become his everyday vernacular in subsequent readings. He asked Cayce to describe Layne's own ailments and suggest cures, and reportedly found the results both accurate and effective. Layne suggested that Cayce offer his trance healing to the public but Cayce was reluctant. He finally agreed on the condition that readings would be free. With Layne's help, Cayce began to offer free diagnostic readings to the townspeople. Reportedly, he had great success and his fame spread. Reports of Cayce's work appeared in the newspapers, inspiring many postal inquiries. Supposedly, Cayce was able to work just as effectively using a letter from the individual as with having the person present. Given the person's name and location, he could diagnose the physical and/or mental conditions and provide corrective remedy. Cayce's accuracy in diagnosing the problems and providing effective cures made him more popular and soon people from around the world sought his advice through correspondence. Cayce's work grew in volume as his fame grew. He reluctantly asked for voluntary donations to support himself and his family so that he could practice full time. Cayce's wife was very supportive of his work, and encouraged him to pursue a humble career as faith healer. He had business cards made, describing him as a "psychic diagnostician." The growing fame of Cayce, coupled with the popularity he received from newspapers, attracted several eager commercially minded men who wanted to seek a fortune by using Cayce's clairvoyant abilities. Even though Cayce was reluctant to help them, he was persuaded to give the readings, which left him with incredible pain in his head, and his energy levels miserably depleted. After experiencing the horrendous result of these experiments, he immediately stopped all attempts at helping others attain wealth and material gain. He took it as a sign from God to use his intuitive gifts only to help others in the way of healing their bodies and spirits. Even after he condemned reading for clients who wanted predictions on monetary matters, some clients ignored his wishes and proceeded to ask such questions regardless, which Cayce unconsciously answered. Once he awoke from trance, however, he felt intense physical and mental strain, and he could tell that his rules had been disregarded. To ensure that it wouldn't happen again, he made it mandatory that his wife must be present during all of his readings, and that she must ask him all of the questions. In order for the readings to go smoothly, it required absolute clarity of his mind and complete relaxation of his body. Cayce's methods of relaxation before every reading involved lying down, untying his shoelaces, loosening his tie and laying his hands gently across his chest. He would then enter into what appeared to be a trance or sleep state, usually at the request of a subject who was seeking help with health or other personal problems (subjects were not usually present). The subject's questions would then be given to Cayce, and Cayce would proceed with a reading. At first these readings dealt primarily with the physical health of the individual (physical readings); later readings on past lives, business advice, dream interpretation, and mental or spiritual health were also given. Cayce gave an estimated 22,000 readings during a period of 43 years (1901 to 1944); however, until September 1923, they were not systematically preserved. Accordingly, only about 14,000 Cayce readings are currently available. When out of the trance he entered to perform a reading, Cayce claimed generally not to remember what he had said during the reading. The unconscious mind, according to Cayce, has access to information which the conscious mind does not — a common theory about hypnosis in Cayce's time. After Gladys Davis became Cayce's secretary on September 10, 1923, all readings were preserved. A secretary, Gladys Davis, recorded his readings in shorthand. Had Gladys not provided her services, there would be no record of Cayce's readings today. In 1925, Cayce relocated to Virginia Beach where he created several institutions which would survive him in some form. By this time he was a professional psychic with a small staff of employees and volunteers. Cayce became increasingly popular toward the end of his life, yet he felt publicity could possibly overshadow healing and theology, which to him were the more important parts of his work. Cayce gained national prominence in 1943, through a high profile article in Coronet. Feeling he couldn't refuse people who felt they needed his help so desperately, he increased the frequency of his readings to 8 per day to try and make an impression on the ever growing pile of requests. Eventually, this took a toll on his health, as he said that it was emotionally draining and often fatigued him. The readings themselves scolded him for attempting too much and warned Cayce that more than 2 readings a day would start breaking down his physical health and would result in his death. Unfortunately when he finally stopped in order to recuperate his failing strength, it was too late. Edgar Cayce suffered a stroke on January 2, 1945. He died a day later, on January 3. Today there are several tens of thousands of Cayce students. Most are located in the United States and Canada, but Edgar Cayce Centers are now found in 25 other countries. The Association for Research and Enlightenment (ARE), headquartered in Virginia Beach, is an organization devoted to the works and teachings of Edgar Cayce. Throughout his life Cayce was drawn to church as a member of the Disciples of Christ. He taught at Sunday school, recruited missionaries, and is said to have agonized over the issue of whether his psychic abilities—and the teachings which resulted—were spiritually legitimate. Cayce distinguishes between Jesus and Christ-hood. Briefly, Jesus was a soul like the rest of human beings. "Christ-hood" is something which he achieved, and to which all should strive to inherit. Cayce accordingly called Jesus humanity's "elder brother." Cayce taught that human souls are subject to certain spiritual laws and Biblical teachings such as, "As ye sow, so shall ye reap" and "As ye judge (others), so shall ye be judged." This departed from traditional Christian teaching that God forgives people and saves them from their sins through faith in Jesus. He was persuaded to give readings on philosophical subjects. Reincarnation was a popular subject of the day, but was not an accepted part of Christian doctrine. Cayce reported that his conscience bothered him severely over this conflict. Cayce affirmed reincarnation, yet other psychics attribute the phenomenon to the influence of ancestors, whose life experiences could be interpreted as "past lives," since there is a spiritual tie to those who came before. Cayce had a window into the spiritual realm, and he interpreted his viewings in the best way that he knew how. But his readings were not always accurate, based as they were on the limited information available to him. Skeptics challenge Cayce's claims of psychic ability, while many conservative Christians and religious groups also question his unorthodox answers on spiritual matters (such as reincarnation and akashic records). Cayce's followers accept that he was sometimes inaccurate. Cayce's sons, Hugh Lynn Cayce and Edgar Evans Cayce, even co-authored a book called The Outer Limits of Edgar Cayce's Power detailing some of their father's mistakes. They theorize that Cayce's accuracy depended on many variables, such as the spiritual motivation of those seeking the reading. Cayce stressed repeatedly that free will influenced all facets of what will become reality, and even something predestined to happen can be postponed or altered. Examples of erroneous Cayce prophecies include him stating that 1933 would be a "good year," when in fact it was one of the worst in the Great Depression; predicting that China would one day be "the cradle of Christianity as applied in the lives of men;" stating that U.S. scientists would discover a "death ray" from Atlantis in 1958; and predicting massive earth changes that have not occurred. Cayce said that his trance statements should be taken into account only to the extent that they led to a better life for the recipient: "Does it make one a better husband, a better businessman, a better neighbor, a better artist, a better churchman? If so, cleave to it; if not, reject it." Moreover, he invited his audience to test his suggestions rather than accept them on faith. Cayce strongly believed that dreams are a window into the subconscious mind, and through efforts to recall and examine dreams, one may gain better insight on a variety of matters. Cayce cures. Cayce's medical readings typically prescribe poultices (often of castor oil), osteopathic adjustments, colonic irrigation, massage (often with peanut oil), prayer, folk remedies (for example, charcoal tablets), various forms of electrical medicine and patent medicines (such as Atomidine), and specific recommendations concerning diet and exercise. Cayce is often seen as a practitioner of holistic medicine, and has particularly strong philosophical ties with naturopathy. The Cayce diet. Major dietary recommendations include the avoidance of red meat (especially pork), alcohol (except red wine), white bread, and fried foods; a preference for fruits and (above-ground, leafy) vegetables over starches; and a high ratio (80:20)of alkaline foods over acidic. One meal per day should consist entirely of raw vegetables. Under strict circumstances, Cayce advocated both coffee and pure tobacco cigarettes to be non-harmful to health. “Food Combining” was also a central idea in the Cayce diet. Several food combinations that are contraindicated are coffee with milk or sugar, citrus fruit with starchy foods, and high protein foods with starches. Cayce followed very few of the dietary recommendations that were suggested by him in the readings. Reincarnation. Cayce's work teaches the reality of reincarnation and karma, but as instruments of a loving God rather than blind, natural laws. Its purpose is to teach certain spiritual lessons. Humans have never been incarnated as animals, he taught. He describes a very complex design arranged between souls and God to "meet the needs of existing conditions," which was a reference to the souls who became entrapped in the Earth's physical materiality which was not intended for a habitat of the soul. Human Evolution. Animals have undifferentiated, "group" souls rather than individuality and consciousness. Spirit "thought-forms" stayed near and guided the anthropoid ape which was chosen to be the most ideal vehicle for the human physical race to be created from, and psychically guided their separate evolution into a Homo sapiens species. Cayce's view arguably incorporates Theosophical teachings on spiritual evolution. Astrology. Cayce accepts astrology on the basis that our souls spend time on other planets (or perhaps their spiritual counterparts) in between incarnations. The position of the planets at our birth records these influences. Body, Mind, Spirit. Cayce often invokes these three terms, or their equivalents, to describe the human condition. "Spirit is the life. Mind is the builder. Physical is the result" (conflation of various readings). The concept has application not only to holistic health but also to the spiritual life. Meditation. While Cayce sometimes describes particular meditation techniques of sitting or chanting, the crucial element is that of opening up to divine influences. The Search For God books argue that "Through prayer we speak to God. In meditation, God speaks to us." Cayce's concept of meditation has some aspects in common with Hinduism or Buddhism (the chakras, kundalini) but is most similar to Christian versions of New Thought. The symbolism of the Book of Revelation, he says, is based on meditative experiences. ESP. Cayce accepted psychic experiences and ESP as a natural by-product of soul growth. God may speak through dreams (many readings consist of dream interpretation), or through intuitions similar to the pangs of conscience. However, Cayce does not endorse Spiritualism or mediumship; rather, he encourages seekers to focus on Christ. Atlantis. The Cayce readings affirm the existence of Atlantis, a vast continent with an advanced technology whose refugees inhabited ancient Egypt as well as pre-Columbian America. Cayce's legacy continues through the International Centre of the Association for Research and Enlightenment Inc (A.R.E. ), which he founded in 1931, in Virginia Beach, Virginia, U.S., and through Edgar Cayce Canada, a non-profit organization that promotes education and spiritual growth. For those who believe that Cayce did possess paranormal abilities, his legacy opens up the possibility of human development towards a super-consciousness that will enable improved communication and a new relationship with the planet. His thinking has been compared with that of Teilhard de Chardin, with Theosophy, and with the Gaia hypothesis, that is, that as a new human super consciousness evolves, humanity's relationship with the planet and also with the creator will undergo a radical change involving new responsibilities for stewarding the resources of the universe. ↑ Thomas E. Harris, Outrageous Truth: a mystical paradigm. Retrieved July 13, 2007. Campbell, Dan. Edgar Cayce: On the Power of Color, Stones, and Crystals. New York: Warner Books Inc., 1989. The Straight Dope: What's the scoop on Edgar Cayce? This page was last modified on 25 September 2017, at 22:04.